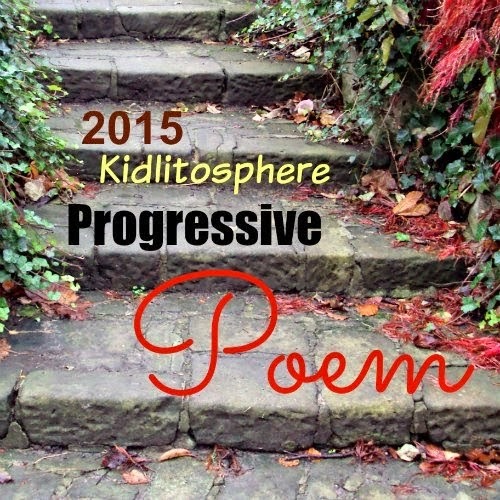 Today's Little Ditty: Day 10 of the Progressive Poem, plus a surprise clerihew! Day 10 of the Progressive Poem, plus a surprise clerihew! For me, one of the best parts of National Poetry Month is taking part in Irene Latham's annual Progressive Poem. It's exciting, spontaneous, fun, and because it's a community writing experience, it takes on a life of its own. From April 1-30, a poem travels from blog to blog, each host adding a new line daily. The results are always richly layered, with a piece of every poet who takes part and the collected anticipation of everyone who has been following its journey. It's a beautiful thing. at Today's Little Ditty you can read it for free. you'll be able to stretch your poetry muscle. © 2015 Joy Acey. All rights reserved. Hello! This totally made my day! In case you missed my interview with Kwame Alexander last Friday, the DMC challenge he's chosen for April is to choose a celebrity and write a clerihew. Besides this fine example (Thank you, Joy! ), I've featured ditties this week from Linda Baie, Charles Waters, and Angie Karcher. Hope I get to read yours! What to do with a delta girl who strokes her grandmother's turquoise bracelet and magically transforms into a mermaid?!! I'm not sure. But I will tell you that with our departure into mermaid sensibility, I'm loving Jone MacCulloch's opening phrase, "she lives without a net," more than ever. an echo of Grandmother's words, still fresh in her windswept memory. Today's Poetry Friday roundup is being hosted by Laura Purdie Salas at Writing the World for Kids. Laura has been providing helpful tips for teachers each day during National Poetry Month. If you're looking for other creative ways to celebrate National Poetry Month, Jama Rattigan is your go-to for NPM festivites at Alphabet Soup. Ah...."windswept memory" is sweeping me away too. And what a fun poem to celebrate the warm and welcoming space you have created here for all of us. Happy Poetry Friday, Michelle! Wow! You have been immortalized! I'm enjoying the traveling poem and look forward to the further adventures of our mermaid. Nice. What were her grandmother's words?! Lovely line, Michelle, connecting 'grandmother's words' with those ibises, & I love the fun of Joy's poem for you, too. That mermaid, still mysterious, is getting more interesting! What a great Clerihew! How fun to have one about you. :-) Fabulous mermaid emerging. A grandmother's words! And a windswept memory! Love this line, and can't wait to see where this goes next. What a fanciful poem. Love seeing how it's unfolding -- a mermaid and a magic bracelet. Intrigued by grandmother's words . . .
And I love how the poem's developing...with grandma's memory in the picture, a world of possibilities opens up for what happens next. You ornery stinker! You just wait, I'm going to have to think of a good rhyme to get you back--poetic justice. Michelle, you have been given celebrity status with Joy's clerihew. How splendid to reward the giver. The progressive poem is shaping up to be quite the tale. Windswept memory-is the sea calling her back? Oh, what could her grandmother possibly have had to tell her that she would remember at a time like this? Curiouser and curiouser! Lovely clerihew for you, too! This progressive poem is taking the most interesting, beautiful turns...and Joy's clerihew is a lot of fun. And that Joy is always living up to her name, isn't she? How fun to have a clerihew written for you. And windswept memory...what an image. Joy's clerihew is fantastic, Michelle, and so is your progressive poem line! It is amazing to me how this poem has taken on a life of its own. It is absolutely beautiful! I'm enjoying the clerihews. Joy's is wonderful. I'm so glad you brought the grandma back! I kept thinking of her.